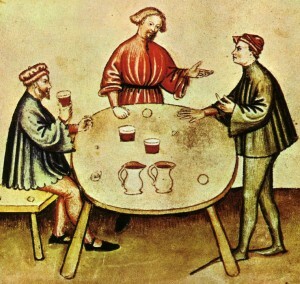 References to various drinks served at a feast were on the increase by the fifteenth century. The main drinks available were divided into wines, mead and beer. These drinks varied a lot by the fifteenth century. Most of the mead and beer was home-produced, although it was also possible to buy the produce in the markets (especially in the Marches, see Beer). Visits to taverns also occurred occasionally (see poem 94.55 and poem 95.55), but according to Guto’s testimony most of these drinks were consumed at patrons’ homes or in abbeys. when faced with the soldiers of the hogsheads. the yonder dwelling of Prysaeddfed’s mead from a casket. : ‘The Oxford English Dictionary’, s.v. broach, n¹.